State Superintendent Mark Johnson and North Carolina Community College System President Peter Hans have joined to proclaim the month of February “Career Pathways Month” in North Carolina. The proclamation acknowledges the many great career paths that are available to North Carolina’s public school students. 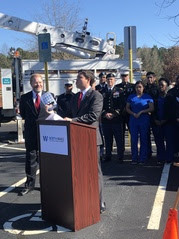 Superintendent Johnson and President Hans made the announcement at the North Wake College and Career Academy in Wake Forest. The Career and Technical Education (CTE) division of the North Carolina Department of Public Instruction works closely with the public schools and community colleges across the state to help students determine which career path is best for them. Johnson and Hans were joined by individuals representing the various career pathways available, including nursing students, technicians, instructors and the military. The mission of North Carolina’s CTE program is to empower all students to be successful citizens, workers and leaders in a global economy. Career and Technical Education services are provided through eight program areas: Agricultural Education, Business, Finance and Information Technology Education, Career Development, Family and Consumer Sciences Education, Health Science Education, Marketing and Entrepreneurship Education, Technology Engineering and Design Education and Trade and Industrial Education.